That wrapped box is a bit of a pink tease, hmm? I just received an e-mail from my former Japanese teacher in Yokohama. She thanked me for my nenga jo (New Year’s greeting card) and wrote that my Japanese had gotten better. I hadn’t told her that 10 handwritten lines of Japanese took me hours to compose, as I built a wall of dictionaries and textbooks around myself. So much for my past resolutions to study hard, gambarimasu, and all that. Nevertheless, here we are at the end of 2009 and I haven’t given up on studying the language and enjoying bits of Japanese culture in the Washington, D.C. area. In 2010 there will be more sake tasting reports on this blog, more outings to Japanese restaurants, and a report on an upcoming trip to a Japanese-style B&B in rural Virginia that has a traditional Japanese bath. My heart just got a bit fluttery with happiness. 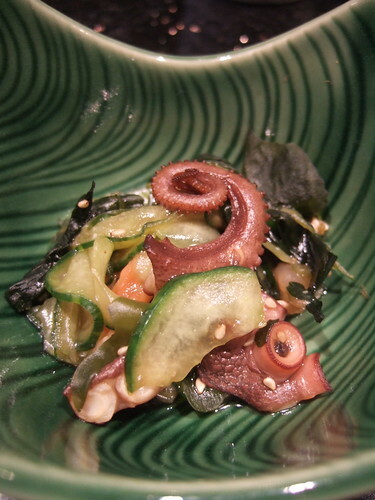 Today’s lunch: Octopus, wakame, cucumber, and salmon salad with ponzu dressing. A few weeks back we were at Sushi Taro and we placed an order for osechi. Osechi ryōri is traditional Japanese New Year’s food. Kyoto Foodie has an excellent series of posts about it, including the symbolic meaning of the various foods. Carlos and I had taken a class in Tokyo on osechi taught by Elizabeth Andoh, so we are eager to try Sushi Taro’s version. 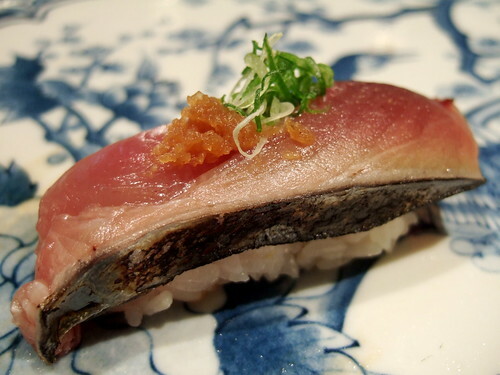 Today’s lunch: Katsuo (bonito) nigiri-zushi. Part of the “Sushi Tokujo” set. Lunch at Sushi Taro today was relaxing. I watched many couples and families (99% of Japanese descent) arrive to pick up their osechi. 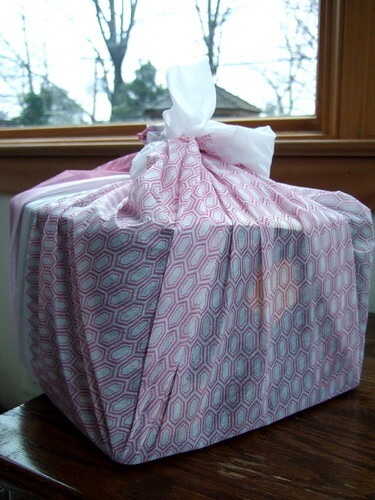 They hoisted the pink-wrapped boxes with a slight hesitation (it’s a heavy box! ), and turned to walk down the stairs. I toasted a few of them as I drank warmed Shimeharitsuru “Jun” junmai ginjo. Yes, warmed properly by putting the tokkuri in a pan of water, not boiled to death in the microwave (I asked). The nose was koji and a bit of crème caramel, the taste started with peppermint alcohol and finished with a lovely lingering tail of sweet almond nougat. I was buzzed before I even drank the sake. New Year’s makes me crazy and full of wary hopefulness. Life is like a box of salted fish roe and dried baby sardines. 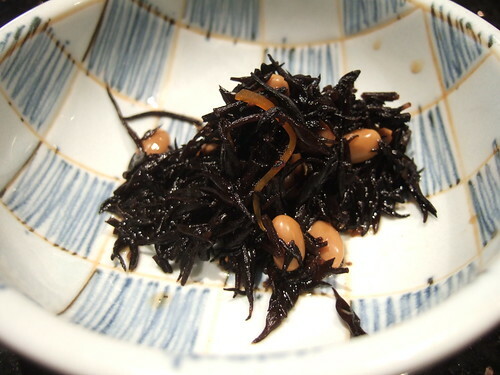 Today’s lunch: Hijiki with soy beans. Happy New Year from Germany. I heard that Japanese people clean their house in December and a lot of gifts are sent around to people who have helped you within the year. Is the New Year’s food box above something like this? You are right about the December house cleaning and New Year’s gifts. The New Year’s food is symbolic (foods that represent fertility and wealth) and also gives the home cook a break from cooking for a few days (osechi foods are stewed in soy sauce, pickled, and otherwise preserved). As far as I understand, a family buys osechi for themselves to eat at home, not as a present for others. The New Year’s “gifts” are money in an envelope given to kids from family members. In any case, I doubt a box of osechi would be given as a gift, but I’ll ask my former teacher.